Made 20 percent lighter than the original M100, the M100U proves that the best can get better in more ways than ever. This tree stand delivers next generation innovation and comfort with its upgraded build without compromising on safety and comfort. The intelligent design is made for the hunting enthusiast who aims to make the most out of every hunting season without spending too much on supporting equipment. The amazing Millennium Treestands M100U underlines the importance of reduced equipment weight in hunting gear. If you have to trudge many miles to the hunting site, it wouldn’t do to be burdened with too much weight, which will tire you out easily even before you get to the perfect tree. You need to conserve energy to be able to hitch the unit to the tree and bring it to the perfect surveying level. Weighing in at just 11 ½ pounds, this tree stand won’t even feel like a heavy-duty piece of hunting equipment at all. 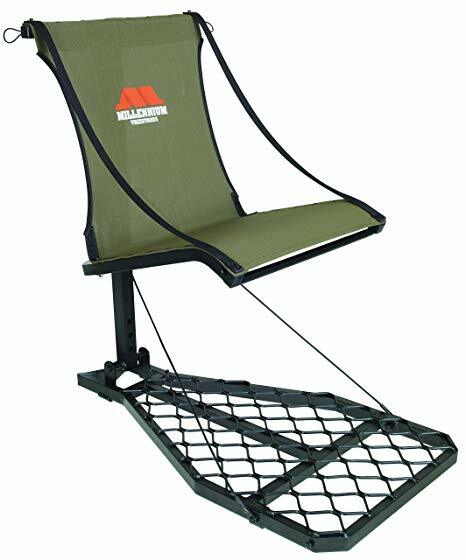 Proven to be the lightest lock-on tree stand from Millennium, this product will be a joy to bring along as you traipse around the hunting site. Get all-day comfort while hunting as you sit high up waiting for the deer to come. This tree stand is equipped with a freshly designed seat that you can raise or lower according to your desired height up to 17 inches for a better viewing level. The aluminum construction makes the seat lightweight while still being able to carry a maximum weight rating of 300 pounds. The tree stand features a seat that measures 17 inches deep and 20 inches wide so there’s enough room to get to a comfortable sitting position during the hunt. The platform is 20 inches wide and 38 inches deep and provides adequate space to move around while observing the area below. You can add to the already comfortable design of the seat by purchasing a shooting rail separately on which to rest your weapon while waiting. If you wish, you can also add a camlock ratchet strap receiver to make installation easier. The tree stand has been certified to the strict standards of the Treestand Manufacturers Association, which serves as your assurance of reliable performance and quality craftsmanship. The tree stand folds flat with ease so you can carry it like a backpack as you move around on the forest floor. The unit comes with a full body harness that has also been given certification by the TMA to signify its adherence to the standards of the industry, thus ensuring safety. The seat folds up and out of the way so you have more space to take aim and get the perfect shot while standing so you can bring down that prized buck. The limited lifetime warranty testifies to the manufacturer’s commitment to making a trustworthy product that can last for years and for many hunting seasons. The durable powder coat finish ensures safety by being free of harmful chemicals such as volatile organic compounds (VOCs) and solvents that are typical elements of ordinary paint. With this tree stand, you always have enough room to feel stable even when you have to take awkwardly difficult shots. The product accommodates up to 300 pounds weight so you can rest easy while being above the ground. 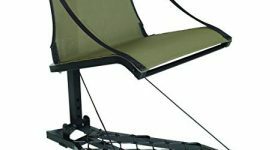 The tree stand features Millennium Treestands’ proprietary comfortMAX contoured, tight sling seat in which you can settle comfortably while lying in wait for the prey. It is engineered to be quiet so it won’t scare the deer away with unwanted noise from the structural components. Easy to set up, this tree stand comes with a camlock receiver to ensure problem-free and quick anchoring to the tree. You can easily fit a bow holder to the seat to keep your hands free while waiting. You can also add a foot rest for greater comfort. This tree stand boasts a solid build that you can rely on for many years. Get it now and be sure to make excellent trophy catches every hunting season.